Discover our new viewing facilities. 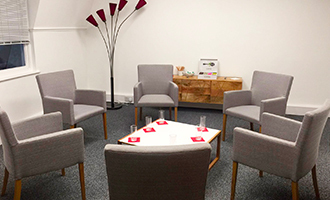 Surrounded by calm and quiet, this room can welcome up to 20 respondents. Equipped with a two-way mirror, this lounge can welcome up to 12 people. Bright and spacious, this room can welcome up to 20 respondents. Equipped with a two-way mirror, this lounge can welcome up to 6 people. More intimate, this room is perfect for IDIs. 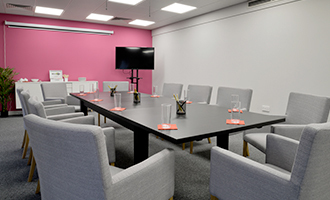 We have 3 stunning, fully equipped studios to help you conduct all your qualitative projects (focus groups, individual interviews etc) right in Birmingham City Centre (less than 5 minutes walk from all 3 main stations). 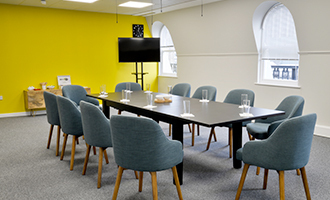 Colmore and Newhall can comfortably seat up to 20 participants in a formal or informal setting, while Sarehole can easily seat smaller groups and IDIs. Our clients lounge (behind the one way mirrors) will allow you to enjoy every second of the research in a relaxed yet professional environment. The entire space is bathed with natural sunlight and offers an ideal environment for great insights! Oh! Have I mentioned the wonderful team that will make sure the highest standards are met? If you wish to add any extras to your room hire, please visit the Services page. Catering: you have the option of ordering food for your participants and clients up to 6pm the day before.